COLLINGWOOD looked to the 1988 national draft desperate to secure a classy rover. Two of those chosen went on to premiership glory with the Magpies; another shone brightly in his debut season, winning the club’s best first-year player award in 1989, before injuries and inconsistent form cut short his time in black and white. Colin Alexander, from Clarence in Tasmania, was chosen by Collingwood as pick 25 in that draft. On draft selection alone, he was chosen ahead of Scott Russell (pick 39) and Tony Francis (pick 95), and while those two South Australians would go on to become club greats, Alexander was afforded only three injury-interrupted seasons with the Magpies. Russell and Francis chose not to move to Victoria Park until 1990. 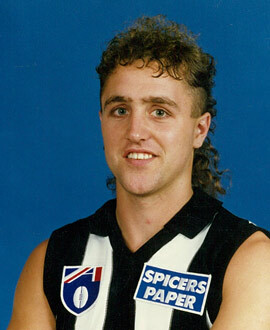 Alexander made the move in 1989, having a year’s head start, sensing an opportunity to fill a Magpies’ roving void. That he played only 24 games – and kicked 28 goals – seemed cruel, given how well he played in that first season, with his career promising so much, but his body letting him down in the years after. Alexander had been a member of Tasmania’s Teal Cup team and was one of four members of that side drafted by the Magpies – the others were Michael Smith (Devonport), Peter Divenuto (Sandy Bay) and Nick Probert (Burnie Hawks). He would almost certainly not have made it to Collingwood without the guidance of Magpies great Bill Picken, who showed him a series of videos of VFL players to convince him he was good enough. Picken had coached Alexander – then an apprentice boilermaker-welder – in 1988 at Clarence. The curly-haired rover, who was 178cm and on his way to 74kg, was hard at the ball, possessing better than average speed, and was at times pugnacious in the heat of battle. Alexander debuted just over a week short of his 19th birthday. He had 10 disposals and kicked a goal, after receiving a handball from David Robertson. Collingwood won by 10 points, and he held his spot for four consecutive weeks. He was relegated to the reserves in Round 5, but on his return the following week produced one of his best performances for the club, including winning kudos for standing his ground when Demon Jamie Duursma crashed into him. Alexander ended up playing 18 games that season, finished second in Collingwood’s goalkicking list with 25 goals to Brian Taylor’s 49 for the season. For a time, he was even spoken about as one of the VFL’s recruits of the year. The 1990 season seemed set to be a big one for Alexander. But he had post-season groin surgery, then suffered a pre-season scare when on the wrong end of a “perfect hip and shoulder” from Fitzroy’s Gary Pert in Benalla. The even bigger threats, however, came with the arrival of Russell and Francis (by then considered the best rover outside the AFL). That was always going to put a squeeze on which of the rovers would make their mark. All three – Alexander, Francis and Russell – played in the opening match of 1990, against West Coast at Subiaco, though Francis would be suspended for six weeks for kicking Murray Rance. But injuries and his own suspension (five weeks, also for kicking) ruined his chances of being part of the premiership. The closest Alexander came to success that season was when he kicked four goals and was one of the best players in Tasmania’s shock win over Victoria. Having missed the 1990 flag, Alexander harboured hopes of reclaiming his senior spot in 1991. But it wasn’t to be. He played only two more games in 1991, kicking a goal in each, but he starred when playing in the VFL side. He was third in the 1991 Gardiner Medal, behind teammate Stephen Anderson. Just three seasons after joining Collingwood, Alexander was on the move. He ended up with Brisbane and looked to making some ground in the early rounds of 1992 before suffering a season-ending knee injury in Round 3 against Fitzroy. He would manage two more matches in 1993, but at 23, his AFL career was over. Alexander moved back to where it all started – Clarence – and despite the fact that further knee issues dulled his pace, it couldn’t quell his competitiveness. He kept playing for as long as he could, despite the need for pain-killing injections to get through games, and against the advice of his doctors. Fortunately he was able to finish his career with a few flags with Clarence. If luck had deserted him at Collingwood, it seemed only fitting that he tasted some success when he went back home to Tassie.